Are you ready to get your Ghoul on? Are you going trick or treating? Will you be giving out frightful treats? My little monsters are amped up and ready to hit the houses up for candy. and we are all ready to go. I'm NOT ready for the hyper, bouncing the wall kids whom I will want to hang by their toes after consumption of all this candy. This is when as parents, we wish for pencils and fruit to be given out. Okay maybe not fruit....there are too many crazies out there...no way my kids getting poisoned apples. No fruit or homemade treats from strangers houses for my kids. 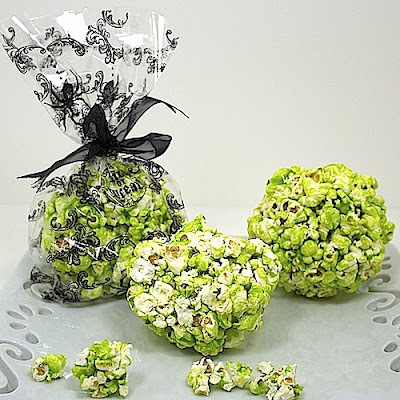 Years ago it was safe to eat popcorn balls that were handed out to trick or treaters. Now you have to inspect even store bought candy that was given out. Popcorn balls are a family Halloween tradition for my husband. His mother made them for him EVERY year. This year I thought I'd start the tradition in our home. I called my mother-in-law and got her recipe. She told me what to do and said to work fast and it was hot. She did not tell me I was going to scald the hell out of my hands. "Some things in life are best left for mothers. Next year your son's balls are all yours." I had to add a little humor, after all I was in pain here. and tied with satin ribbon. The final results were great and the kids loved them. Seeing their cute little faces gobble them up was worth my scorched hands. If you wish to take a chance with death and want to make these cute treats for your little ghouls, just follow the recipe below. place sugar, water, corn syrup, salt, butter and food coloring in a saucepan. Cook on med/high heat until it forms a hard ball (260 degrees). After it reaches a hard ball add vanilla. Remove from heat and pour over popcorn. Mix it fast. Butter hands and form balls. After balls are formed place popcorn in a cute Halloween Cello bag and tie with a ribbon. LOL! Sorry about your scorched hands! Hilarious what you typed mother-in-law. Glad I had already taken a sip of coffee before reading that line! See ya tonight!